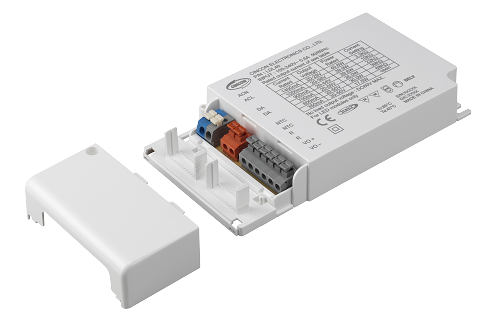 The LDL40 Series offers DALI dimming interface with dimming range from 1%-100%. DALI 2 certificated. Up to 2.5Φ diameter wire for terminals of (L/N) for easier installation. Higher surge protection 2KV for L-N.
Universal input: 90-264VAC Adjustable output current setting for 6 different output currents from 350mA to 1400mA. Output voltage range from 15VDC min. to 50VDC max. Operating temperature: -30℃-60℃ with power derating. Compliant with EN61347-1,EN61347-2-13 for safety, EN55015 Class B for EMI, EN61000-4-2,3,4,5,6,11 for EMS, and EN61000-3-2,3 for harmonic current. It has short circuit protection (Hiccup Mode, Auto Recovery), over voltage protection, NTC and over temperature protection. LDL40 has both independent and built-in type safety approvals for LED fixtures.